This week has been a little rough! I recently started my new internship which I am loving, but now I'm left with next to no free time during the week. I also am finally getting over the cold that I had, so hopefully things will be better now that I can fully settle in to my new schedule. Since things have been picking up for me recently, I'm obviously excited for spring break which is coming up soon! I have something extra exciting coming up right around then as well, which I'll be sharing with you soon enough! So in the free time that I do have, I've been trying to focus more on my blog and making extra effort to have more outfit posts! I was excited to write this post because these espadrille wedges have been EVERYWHERE lately. I mentioned them in my 5 Current Favorites post, and thought it would be fun to style them in today's post. This first outfit is perfect when you want to dress up a casual outfit. 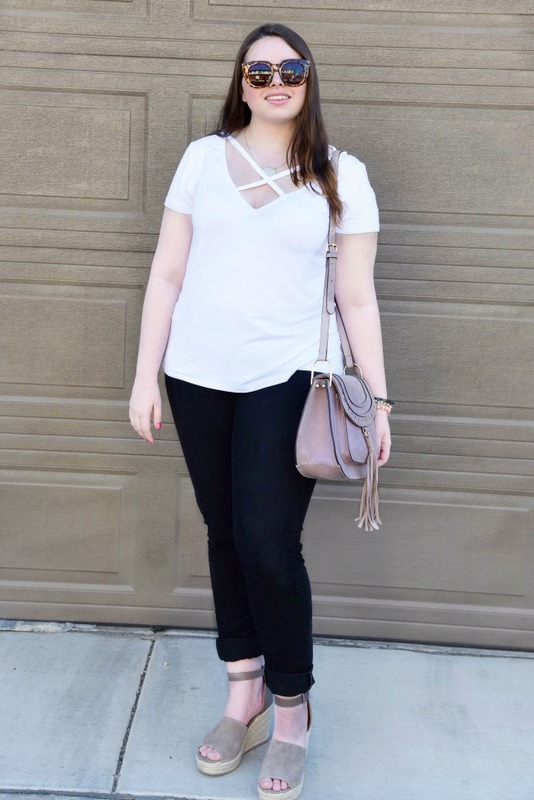 I love this criss cross top, because it's simple enough that I can wear it with pretty much anything in my closet but the strappy detail makes it so much more fun than a regular t-shirt! I wanted to keep the focus on the shoes, so I kept the rest of the outfit pretty neutral. 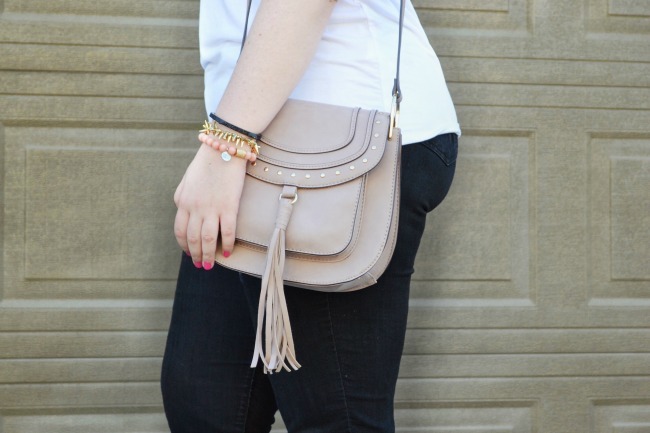 Neutrals are always so easy to throw together, something I always love when it comes to putting together outfits! This type of look would also be fun if you were to add a pop of color with a bright purse or trendy pair of sunglasses. This second outfit is definitely my favorite of the two! These wedges do amazing things for your legs (seriously I was gasping at how good my calves looked in these photos!) and they're just begging for them to be shown off in a dress. I'm kind of obsessing over this chambray one from Tobi since it's so perfect for spring. Off the shoulder tops and dresses are still on trend this upcoming season, and these tie sleeves are adorable! 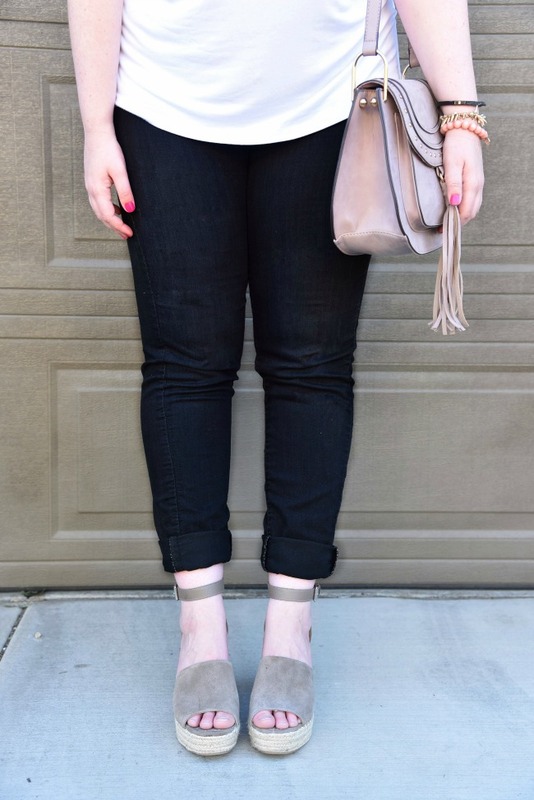 Love how you styled those wedges two ways! I would probably wear them with jeans and dresses too! So cute! I love the wedges. They look adorable with the dress. I love both outfits but the OTS dress is my favorite! And those Marc Fisher wedges are my must-have new item for Spring, too! In love with these pretty wedges! I got a similar pair and am dying to wear them! Cutest wedges! And love the bag! Both looks are super cute!! Love those wedges!! SO cute! I love how you styled both looks! Those are such cute espadrilles and I love how you styled them! Cute looks Sami! I love your sunglasses and bag! One of my favorite shoes of the season! Love both ways you styled them! 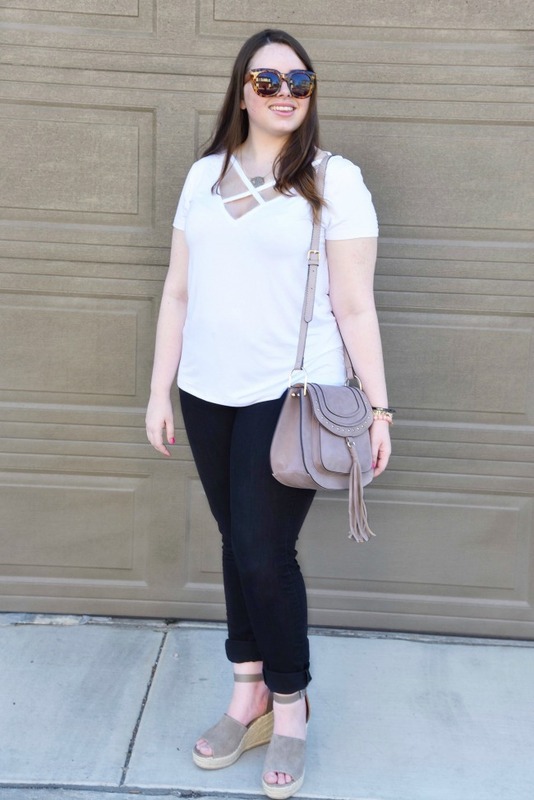 Love those wedges for spring and both of your looks are so cute! Great styling ideas! Such a cute pair of wedges! They definitely are my go-to during spring/ summer! I love both of these outfits, but I think the OTS dress is my fave! It's so perfect for summer! These wedges are gorgeous! Love the outfits! What fun shoes! You look gorgeous! I think I need a new pair of shoes! Oh my goodness, how cute are you?? I love these looks! Those espadrilles are my favorite! I've been loving the wedges look!! So happy you found a pair at DSW I can afford! Love these looks! And those shoes have been a favorite of mine lately. Love the way you styled these! The first look is my fave! I bought these wedges in the same color, great taste!! ;) But, aren't they the best?! Love the looks you styled them with! These wedges are to die for! Seriously so cute! Love both looks! Your wedge sandals are absolutely adorable and I need to get me a pair! I love how you styled these and also love the color. I just ordered a pair and I hope I love them once I get them. Definitely a pair of wedges that will get multiple uses and can wear quite a bit during spring and summer. super cute wedges! I love the way you styled both looks! how pretty are both of these outfits, i love them equally! Such a cute pair of wedges! loving both looks! such cute shoes.